Whatever path you take for relaxation, pampering, or adventure - we have you covered. The Victorian Tudor Inn has vetted numerous vendors and merchants in an effort to provide our guests top quality services at reasonable prices. We also have a wonderful vendor, "Parties Under Cover", that can provide a variety of tents, tables, chairs, etc. A small non–refundable deposit will be required for the reservation of any special package or ceremony. This deposit will be applied to the cost of your package. If necessary to cancel your event the deposit can be used for a period of one calendar year. When you book your room tell us your special requests and we will take care of the details. And for those not desiring an overnight stay, but looking for that unique atmosphere to make that Anniversary, Birthday, or Retirement party very special please contact us. We also provide a comfortable location for staff development opportunities and retreats. Laptop, TV, VCRs/DVDs can be provided. Below are listed some specific packages that may interest you. A specially designed gift certificate, with a colorful brochure, can purchased in any amount of your choosing. Our gift certificates have NO expiration date and will be accompanied by a gift card hand–made for The Victorian Tudor Inn. We can send these directly to the an individual or to you. Please call for further information or to purchase one of our gift certificates. 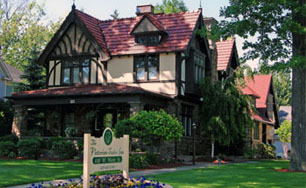 The Victorian Tudor Inn can accommodate a variety of weddings, from small wedding parties of 6 to larger parties of 125 guests. The house, containing two different distinct public areas, each with its own special fireplace and ambiance, can comfortably accommodate smaller wedding gatherings from 6-35 people. The grounds can accommodate up to 125 guests. Private, off-street parking is provided. Valet parking can be arranged. It is recommended that you speak and meet with one of our staff members to personally design your special wedding package. We have unique vendors who can provide a variety of wedding props and designer style discounted wedding gowns (Fairy Tale Weddings), caterers (Blue Ribbon Catering, Oddo Catering), and flowers. We can also arrange for wedding cakes, tents, horse and buggy and other miscellaneous needs. Our horse and carriage vendor has several options. Check-out their web site at www.windyhollowfarm.us. We can also arrange for a state authorized and licensed Wedding Officiate. Also, available for our wedding guests is a 2007 white Cadillac DTS and/or a beautifully restored 1937 Powder Chevy Street Rod. There is a cost, in addition to the room rate, for use of the Inn and/or grounds for weddings. 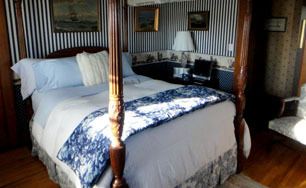 We do have special pricing for our guests who reserve the Inn's rooms for the night before and/or night of the wedding. 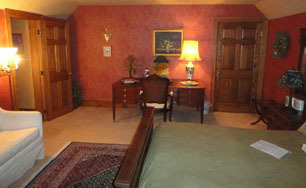 With advance notice, the entire Inn and all its facilities, can be rented for your family and wedding party. 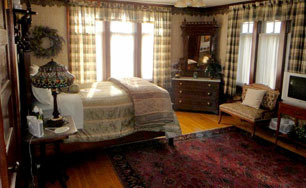 The Inn can accommodate 12–14 overnight guests. 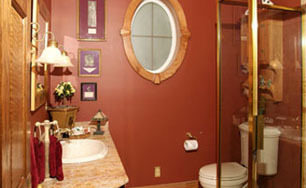 This package will put you in one of our large suites with a marvelous separate Jacuzzi bathroom. 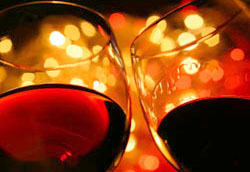 Included will be plenty of candles, a bottle of local Northern Ohio wine (your choice, red or white)– wrapped in fine linen, in an vintage silver wine cooler (a non–alcoholic bottle can be substituted), antique wine glasses, fresh fruit and fresh flowers in a vase for you to take home with you. Also, this package will provide you a basket of culinary delights. This specially prepared and designed basket from our local baker will contain cookies, candies – including truffles and mints, all homemade, that all the locals rave about, and for good reason. This, of course is in addition to the robes, slippers, and large breakfast that are always provided. A later breakfast time will be accommodated to allow you to sleep in the next morning; along with a later check-out time. 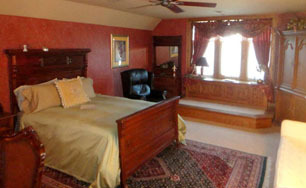 –a 1/2 hour massage for each of you, in your room, done by the professionals from SASS Salon & Spa: $75. Even though The Victorian Tudor Inn can not permit pets, we love them, as many of you do. This package will assist our guests who must travel with their pet(s). For additional costs of $10 per night you can board your dog or cat at Park's Pooch Parlor, approximately three blocks from the Inn. 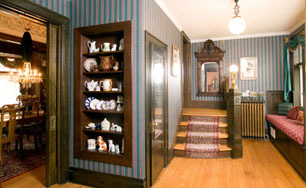 The Parlor has a fenced back yard and the owners live on the premises. Please note that proof of rabies/bordetella vaccines are required. 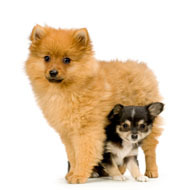 You can also take advantage of a "fluff and puff" for your pet. For an extra $25 give your loved one a bath and have their toenails and ears cleaned along with a special bow or bandana to get them picture perfect. And speaking of pictures, we have the wonderful opportunity to offer you a family portrait with your pet. Firelands Photography of Bellevue will take a portrait on site at The Victorian Tudor Inn of your pet, you and other family members for $35 - $55 (Mon - Fri). 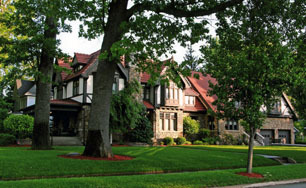 You owe it to yourself and the rest of your team or members to hold your next meeting or retreat in the historic elegance of The Victorian Tudor Inn. Meet behind the same massive pocket doors that Bellevue's civic and corporate leaders did in the early 1900s. 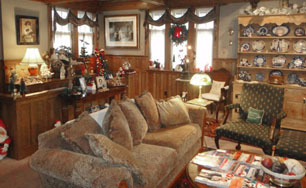 There are three separate spacious public rooms, two with working fireplaces, available for your use, and also a fully stocked kitchen for beverages and light snacks. Catering, designed to your specifications, is available for lunch or dinner. 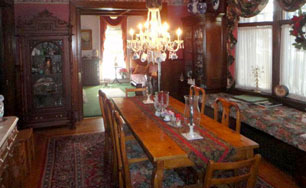 And of course, being in one of the most unique atmospheres in North Central Ohio, with extensive antiques and artwork. We are near Heidelberg College and Tiffin University, Terra Community College, and the BGSU Firelands Campus. In addition to the wonderful accommodations we can provide, you will also have the opportunity to converse with the Innkeeper, a former University Dean, and get important information about higher education, including crucial questions to ask of your school. The Innkeeper during his career oversaw crisis management/campus security, the residence halls, student orientation, counseling and health services, Greek life, study abroad programs, Div. III athletics, and other departments. An afternoon tea is perfect for your special organization, a Red Hat Group, an office party, a baby or wedding shower, or just a get–together with your best friends. Reserve our public rooms on the first floor, with two working fireplaces. These rooms are adorned with an array of Victorian antiques in a comfortable, relaxed surrounding with the wonderful smells of burning candles. 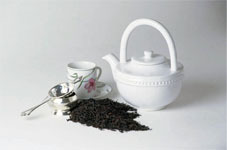 Our staff will prepare you English Teas and also fresh brewed coffees. You will be served finger sandwiches and special sweets, all on vintage china with antique flatware and linen napkins. Please consult with us regarding dates and prices. 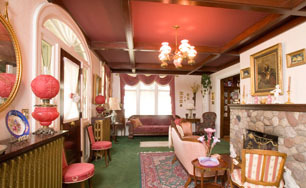 Plan to meet your friends for a night or two at The Victorian Tudor Inn. Plan to be spoiled! Rent the entire house at a special price and allow our staff to take care of all the cleaning and cooking. Relax in the hot tub with an LCD TV and use the living rooms, porch, deck, exercise room to mingle and catch up. In addition to the usual full service breakfast you will be treated to unlimited pizza, freshly made chocolates, and other refreshments during the evening. This special package allows you to "take over" this magnificent house during your stay and to comfortably accommodate 14 people. Call for prices and any special requests you may have. 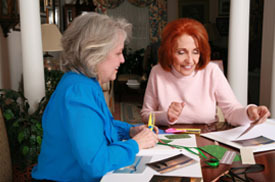 Gather all your friends to engage in your hobby for an evening or the weekend. Leave the cleaning and cooking to the staff at The Victorian Tudor Inn. 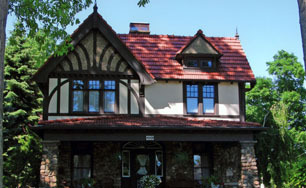 The Inn will comfortably accommodate 12 – 14 women. Enough tables, chairs and outlets are available for your needs. The entire house, with its working fireplaces, is yours to use. As usual a full breakfast is provided for all in your party, along with continuous snacks, coffee, soda, and other beverages throughout the day.